The 2017 Root River Roundup was held May 12-14. This year just might have been the best ever, which is really saying something considering it was the 16th annual event! 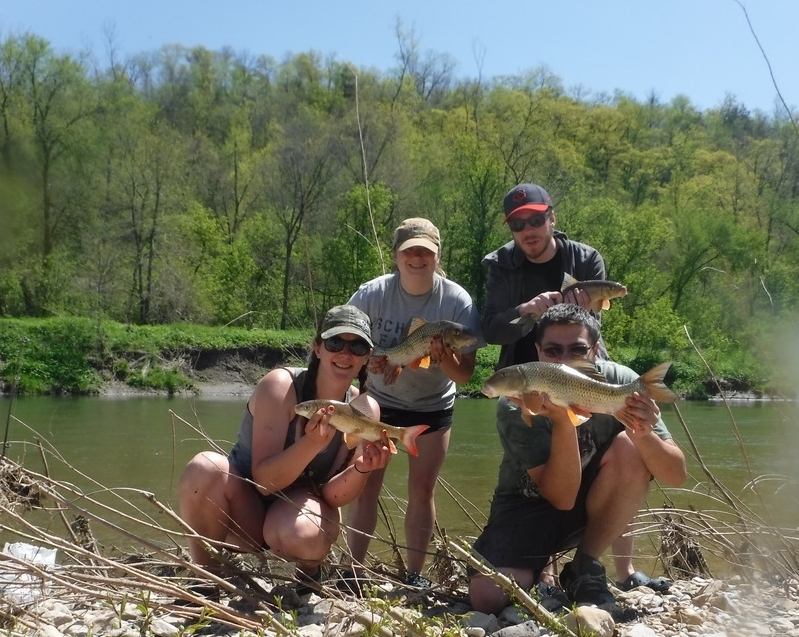 The combination of beatiful weather, high quantity of fish, perfect timing for the Silver run, and a few encounters with rare species made it a Roundup to remember. 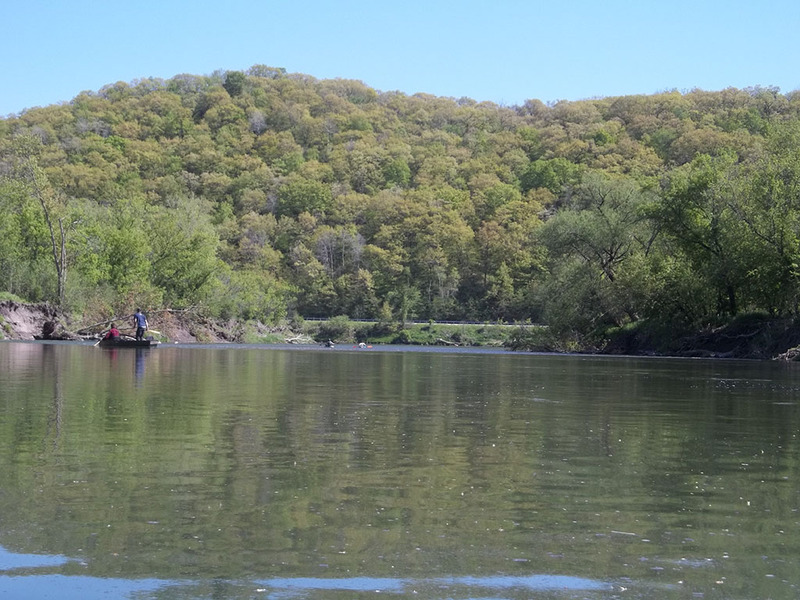 The Root River was also flowing at near-perfect levels and water clarity. 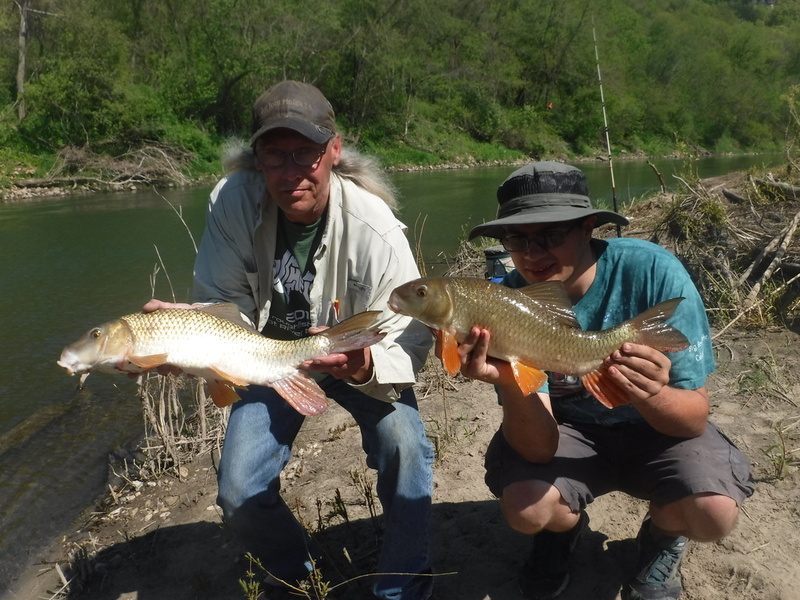 Oh yeah, and who could forget a brand new golden redhorse State and World record which bested the old one by a long shot! 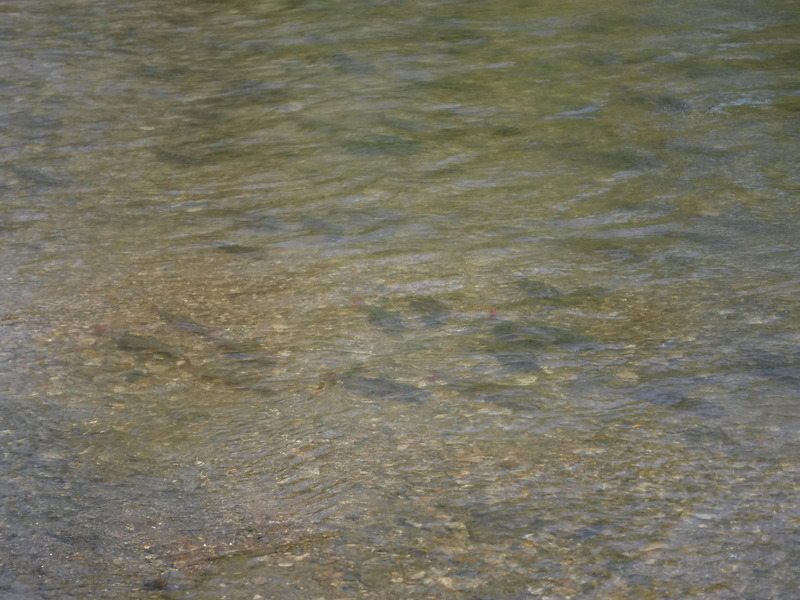 Friday morning, I showed up to Eagle Cliff campground and was greeted by a handful of early-arriving Roughfishers. They told me that fishing had been great, and I surveyed the run below camp from the high bank. 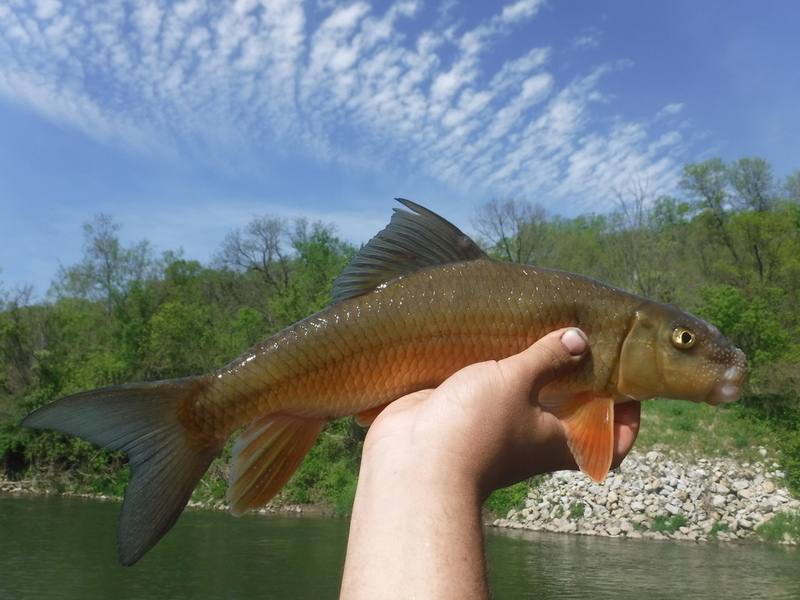 Hundreds of redhorse were visible and active on the gravel shoals..
Those of us who were doing the traditional Friday float trip made a convoy up to the dam at Lanesboro. 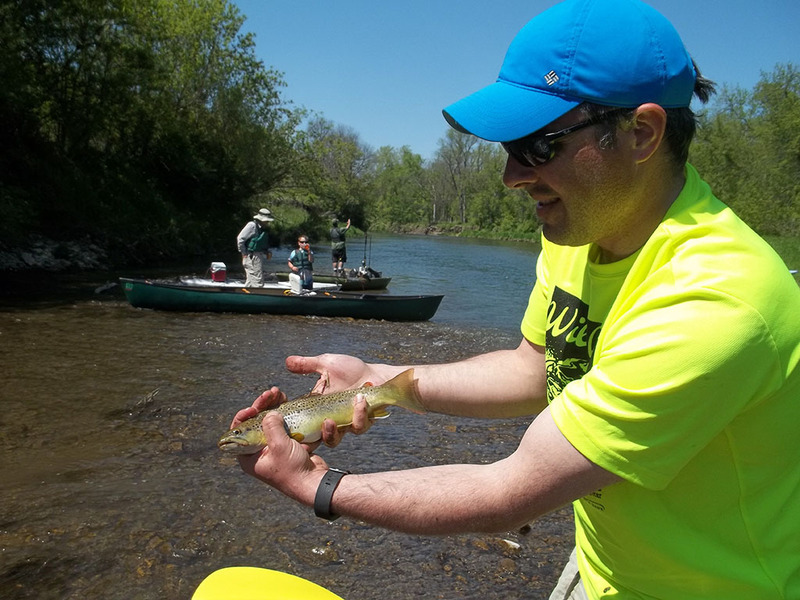 Our trip down the fast-running, crystal clear river was fantastic, and a lot of good fish were caught along the way. Here's a shot of most of the Flotilla at the put-in. 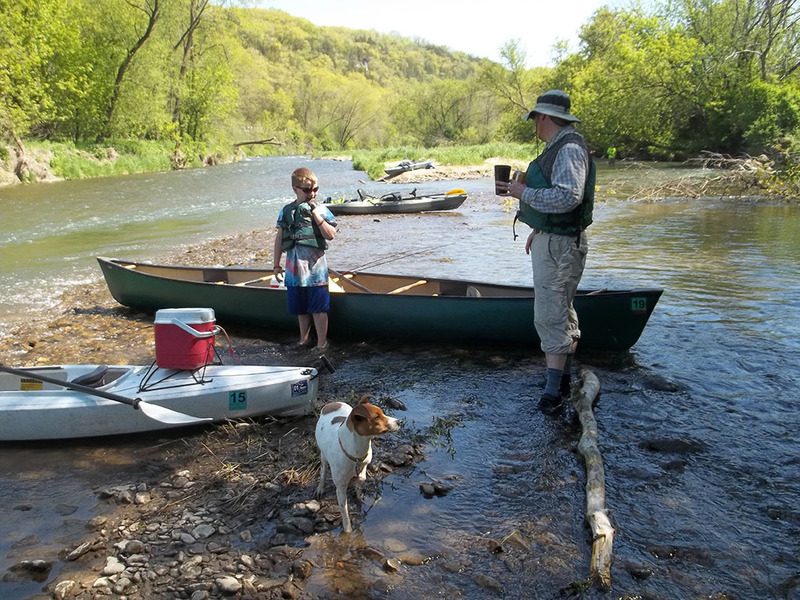 Here is a photo at the end of the float trip, as we came back into camp. Our beloved camping area at the far upstream end of Eagle Cliff has endured some detrimental bank erosion over the years. 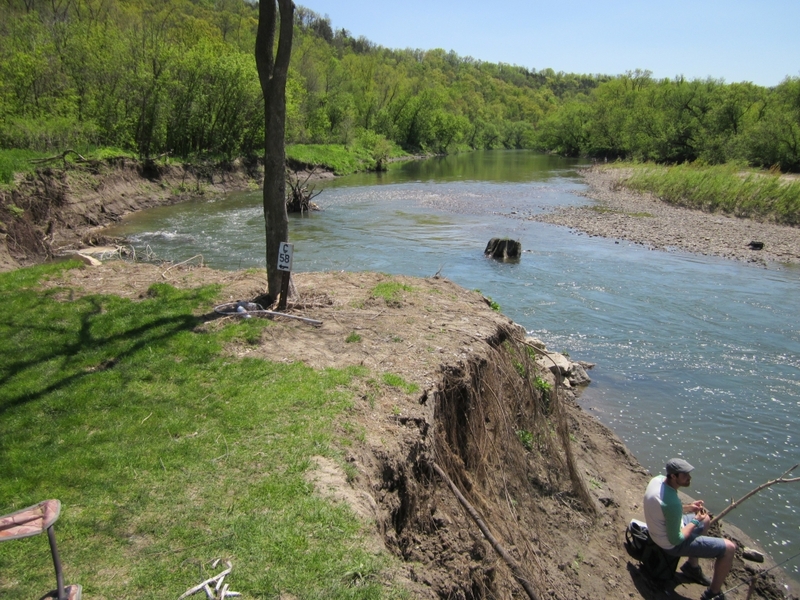 The campground owners have plans to put some riverbank stabilization in place, but are waiting for final DNR approval. There was a large pile of earth in the midst of our camp this year, waiting to be used. It will be very interesting to see what it looks like in 2018. 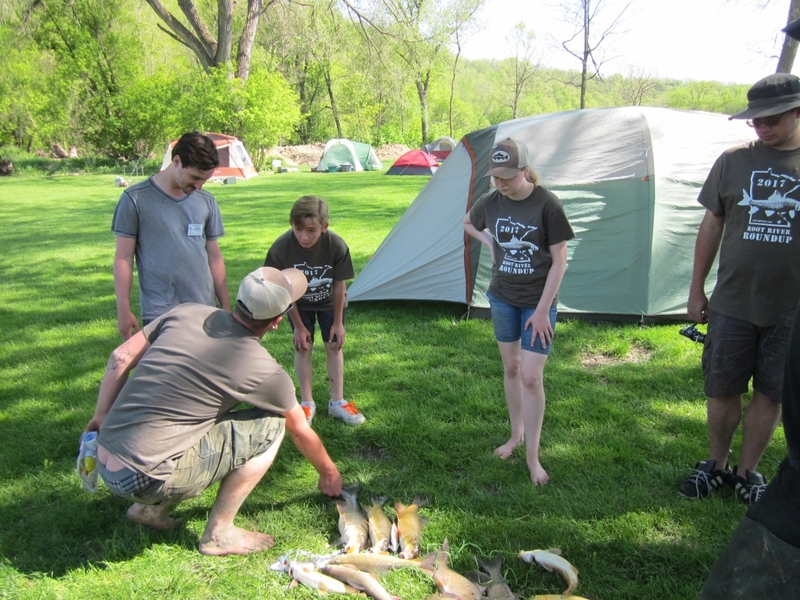 The fishing action around camp on Friday afternoon was great! Just below the tents, Roughfish29 reeled in a fantastic catch with this spotted sucker! Only the second one we have ever encountered here, this rare beauty put a smile on his face as he added it to his lifelist. Amazingly, two more spotted suckers were caught from the same area in the evening by TonyS and Dr. Flathead. 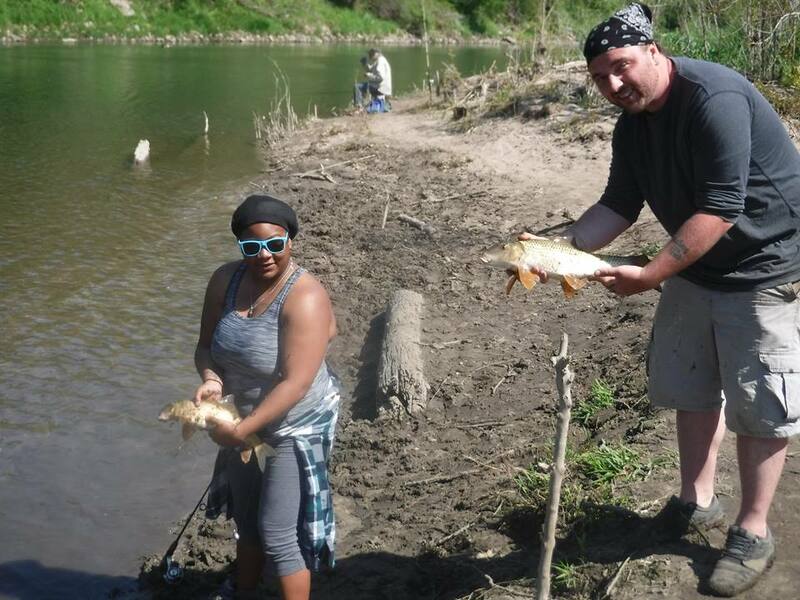 Huge congratulations to all three of these Roughfishers for attaining a new lifelist addition! 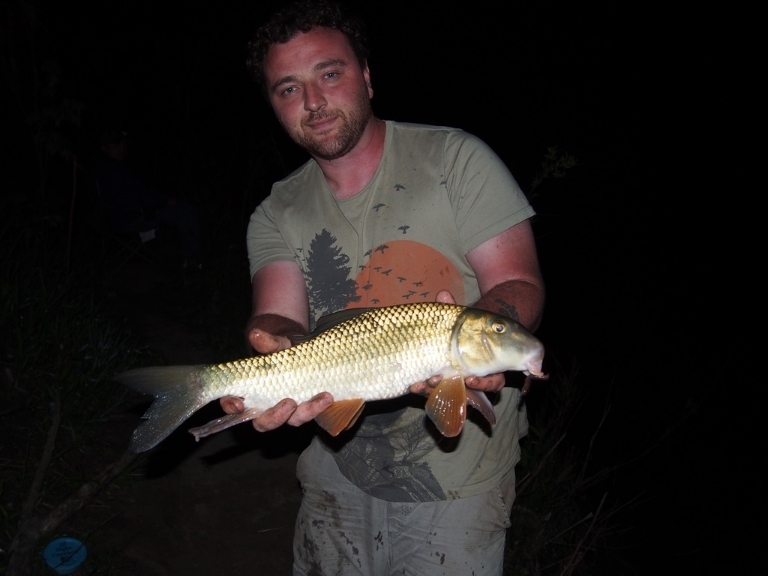 Night fishing down at the Bend has become very popular, as more and more Rounduppers have learned that some good action can be found. 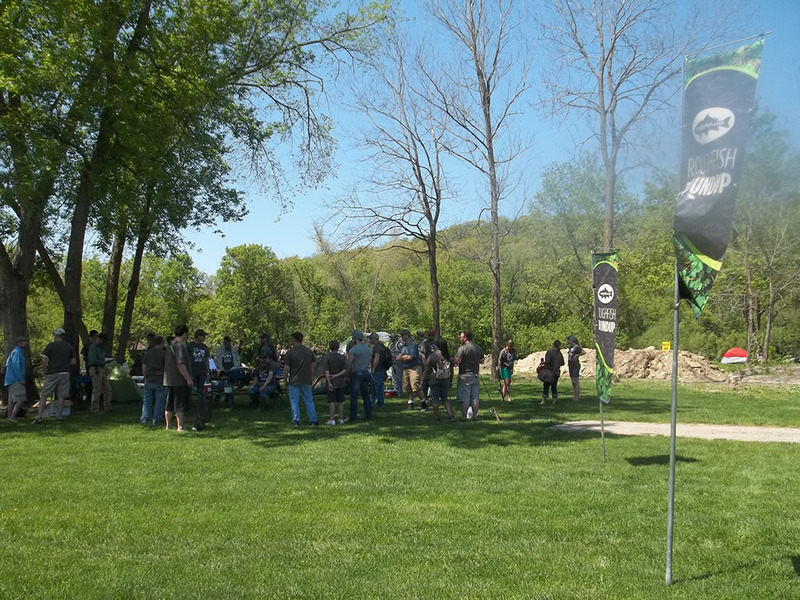 Beyond the good fishing, great cameraderie is had while sharing riverside campfires and joking around with fellow crazy anglers. This was a good year to spend some time night fishing. Saturday morning dawned warm and sunny, and everyone was in high spirits. Fishing action remained very good, and along with the usual suspects quite a few trout were added to stringers before the sun got too high. 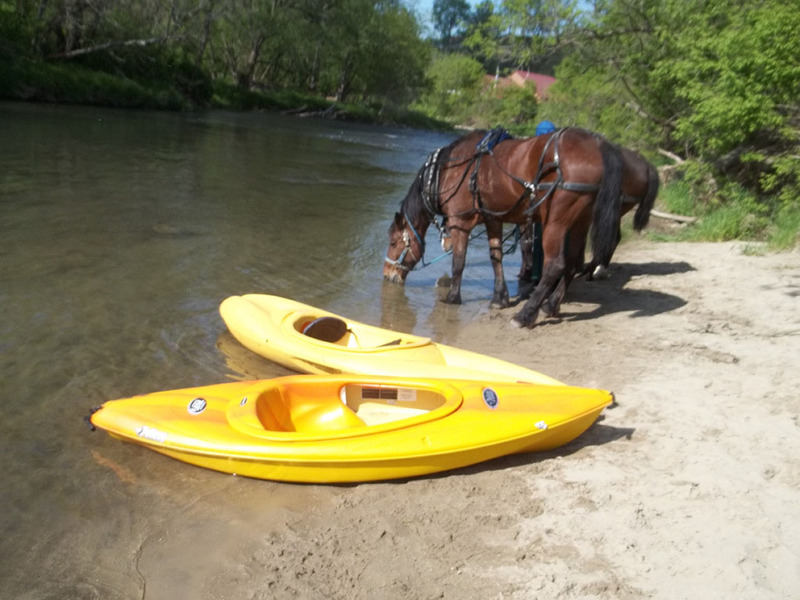 Jackie and Allyson traveled upstream to Lanesboro to float the river in their kayaks and met the local Amish transportation. Folks were plotting and scheming for the Species Derby which started at High Noon. Everybody got registered and made plans for the 3-hour no holds barred knockdown drag out bare knuckle fish fest, and donned their new Roundup 2017 t shirts in preparation for battle. 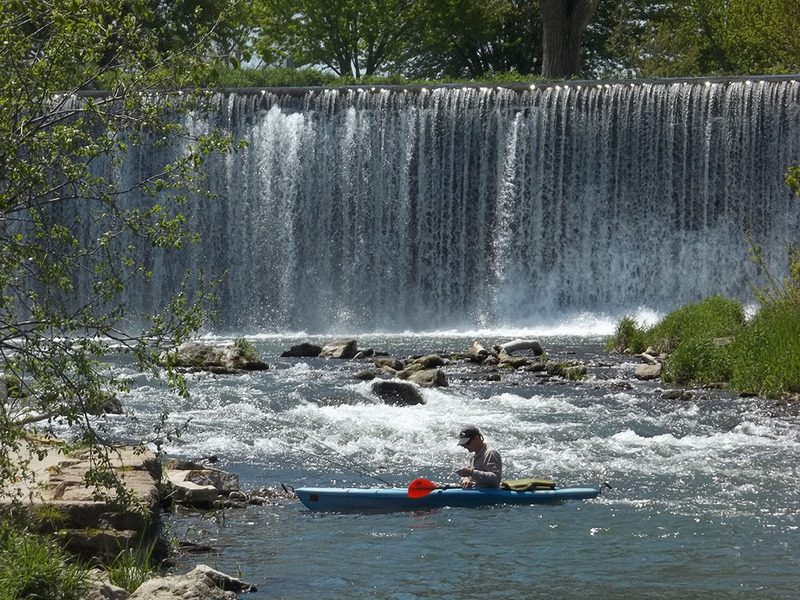 At the opening gun, Derby contestants scrambled up and down the river to stake out good spots. 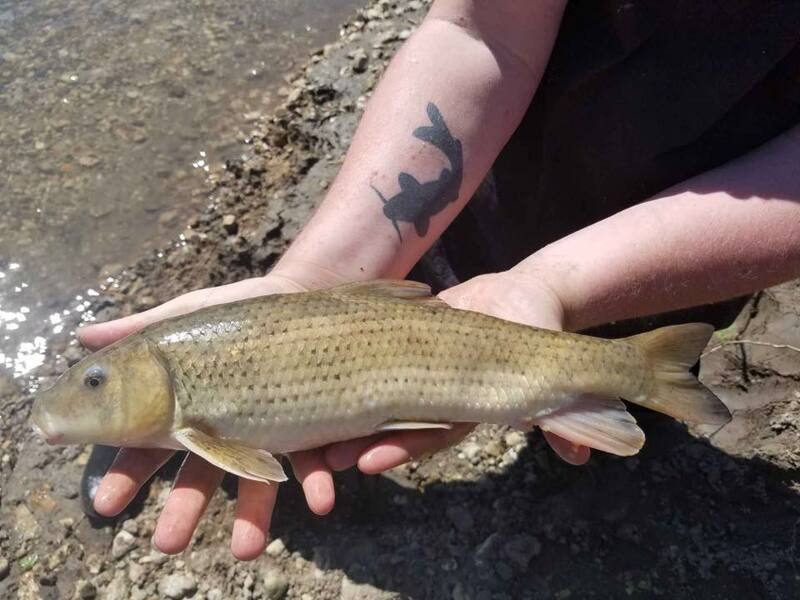 Whoever catches the most species in three hours wins the Silver Redhorse Trophy, along with first pick at the prize table and some serious bragging rights. 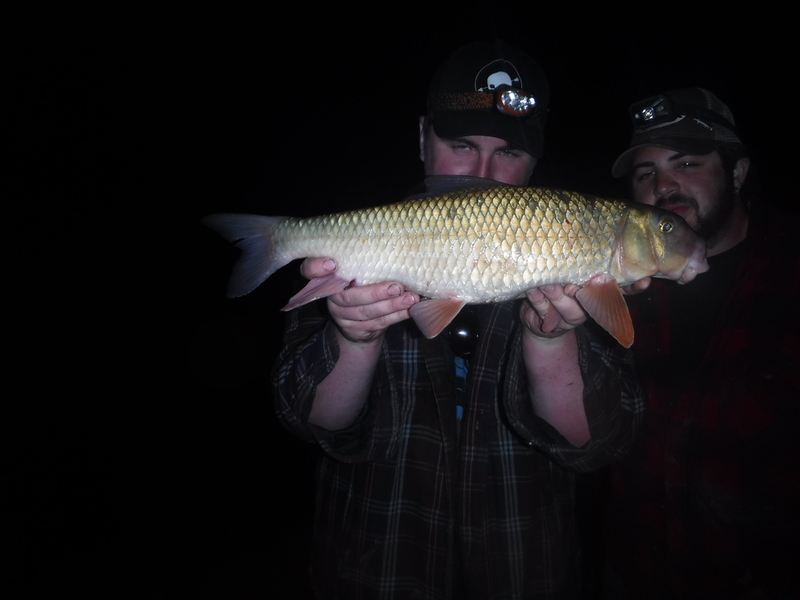 TonyS battles a nice redhorse on his fixed line pole. 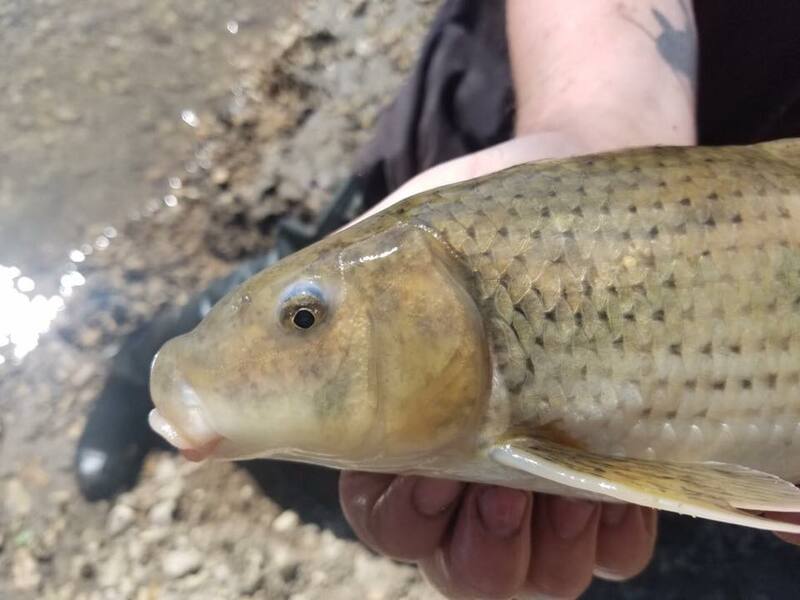 Eric Kol landed 7 species - golden, silver and shorthead redhorse, white sucker, bluegill, rainbow trout and creek chub (Eric, correct me if I'm wrong). 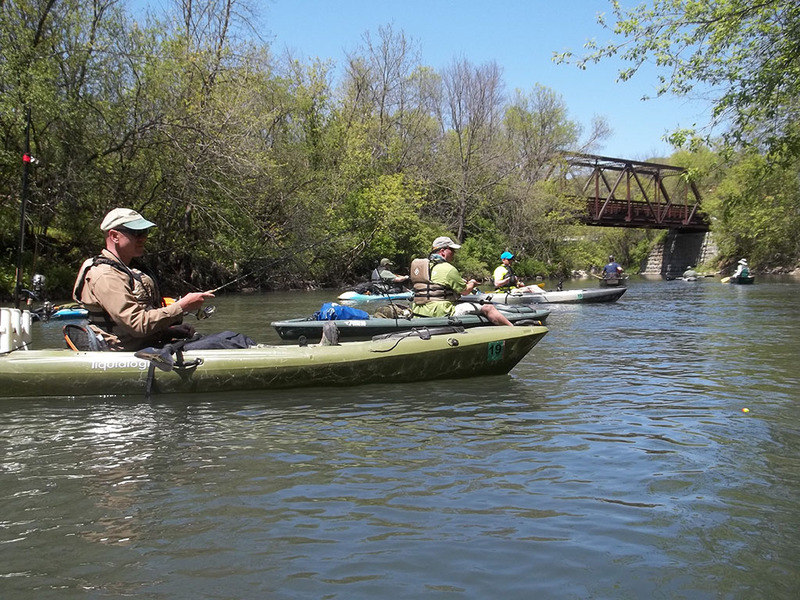 For part of the Derby, he drove upstream to a trib to catch a couple of species hard to find by camp. 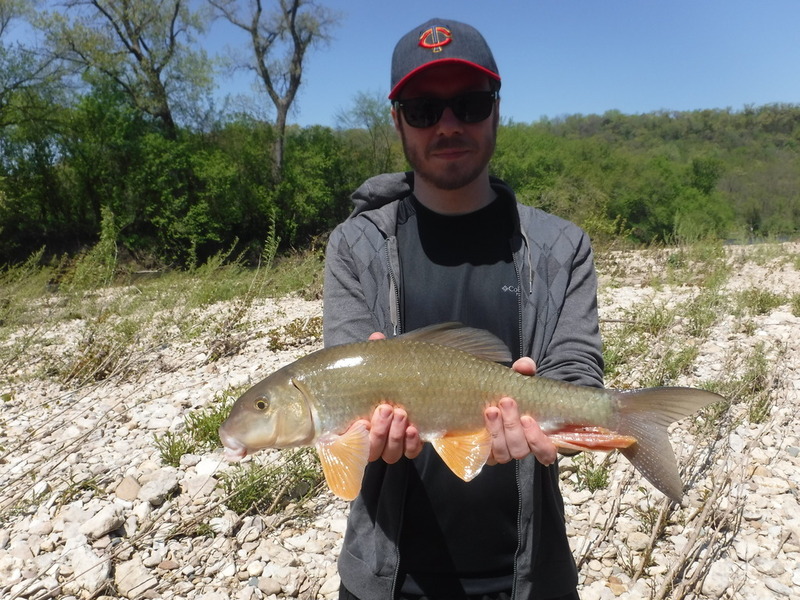 His out of the box thinking earned him the Silver Redhorse Trophy for the 3rd time, with a record-tying 7 species! Kol is the first ever 3-time Derby champ. After the Deby was over, the anglers had kept a fine mess of redhorse and they were quickly processed by expert filleters and fish grinders. Here Moose explains something fishy to the next generation of Roughfishers. Here's a video of Frymaster Angry Mongrel frying the first batch of sucker balls for The Feast. 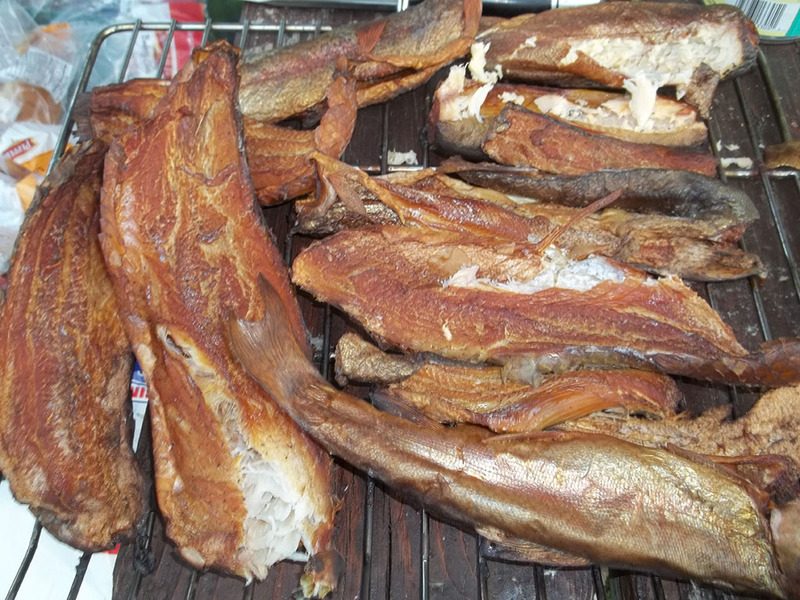 We were also treated to delicious smoked redhorse and trout fresh caught from the river, courtesy of JKnuth and Superfrog. 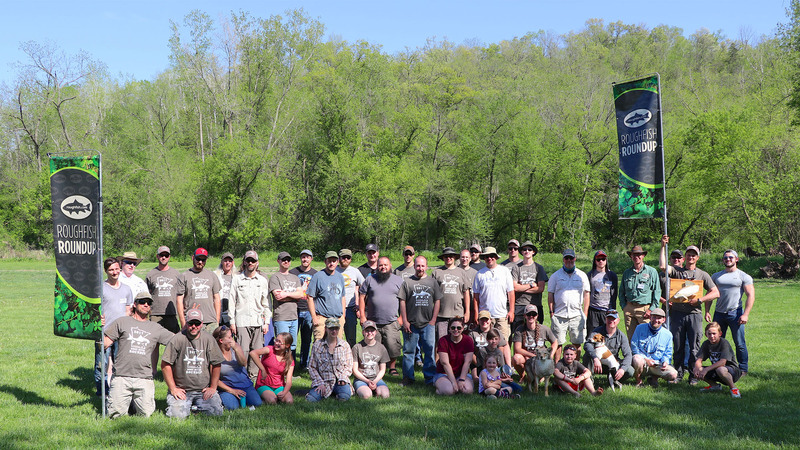 After we all ate a whole ton of deep-fried redhorse balls and all kinds of other awesome food (thanks again to everyone who contributed), the spectacular fishing around camp continued! This year we saw just insane action for silvers, goldens and shortheads. Someone snapped a photo of a wandering coyote that apparently raided some campsites. It was just an absolutely gorgeous day, one I will not soon forget. Afternoon waned and fish kept biting. 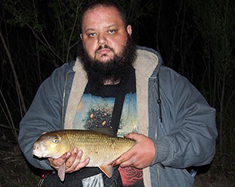 Mathew Williams, who traveled the farthest to come to Roundup from Tennessee, caught a gigantic golden redhorse which weighed in at 4 pounds 7 ounces and smashed the previous State and World record! Wish I could find a better photo, but here it is. What an amazing catch, if I remember correctly it was 24 inches long. Congrats again Mat, this one will be tough to beat! Saturday night, a large group fished down at The Bend. Action was steady, the bonfire was superb, and many laughs were had. 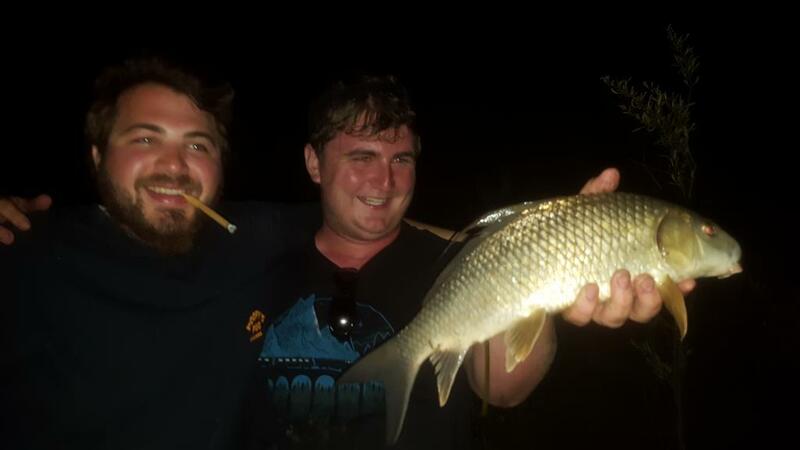 Roughfish29 caught a quillback carpsucker, and the photo really shows how much fun Rounduppers have while fishing after dark. 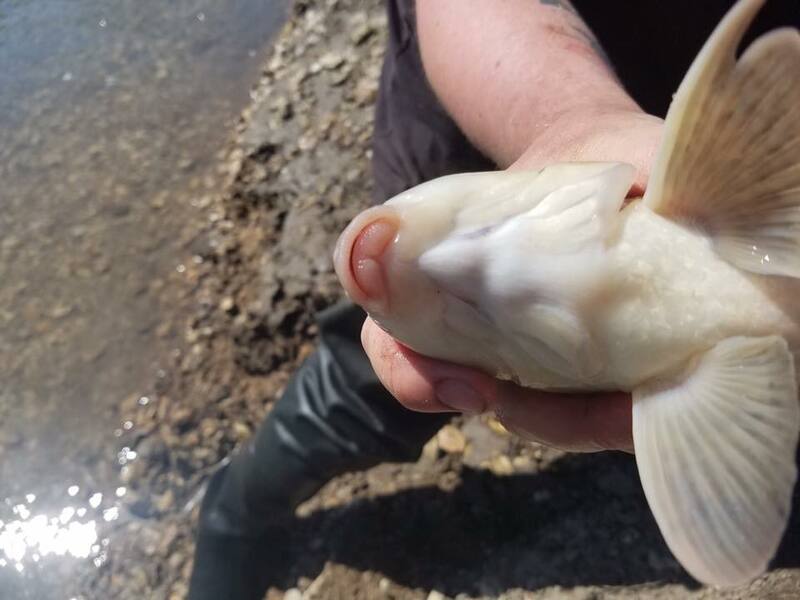 I'm not sure how many carpsuckers were caught, but it was more than a few. 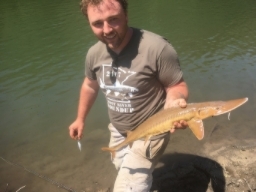 Shovelnose sturgeon were also caught, but I don't have any photos. Hogsuckers, silvers, stonecats, white suckers and shortheads are common catches after dark on the Root at this time of year. Late into the night, the male toads were calling on the river bank so loudly that they could not be ignored. Well, except by female toads it seemed. The toads just would not relent with their droning croaks. One particularly loud toad was sitting right at Eric Kol's feet, and after he politely asked the amphibian to cease his mating calls, Eric grabbed him and tossed him far out into the river. That night he earned the name "Toadchucker". Just a few minutes later the same toad crawled out of the river to again croak right by Mr. Kol and he decided it was time to quit fishing and go to bed. Sunday morning we again enjoyed beautiful calm, sunny weather. The steep valley ridges surrounding camp were a bright, rich Spring green and the Root River rushed by with a quiet voice. I think everyone woke up and took their time today to appreciate the gift that we had been given this year, and bask in the perfection of Nature. Many interesting birds were seen in camp - orioles, red-headed woodpeckers, yellow-rumped warblers, bluebirds and rose-breasted grosbeaks were observed. On a calm morning you might not see them, but the bird's songs echoed through the narrow river valley. On this last morninig, as we all packed up, fishaholicsanonymous89 continued to fish. She had a goal in mind. Suddenly a fish was on her line, and she called for the net - her first ever quillback carpsucker was soon held up proudly for a photograph. I was fishing on this last morning alongside Kyle and a few others down at The Bend. Man, I tell you it was gorgeous. Amazingly we were still catching fish, despite 3 solid days of fishing pressure. 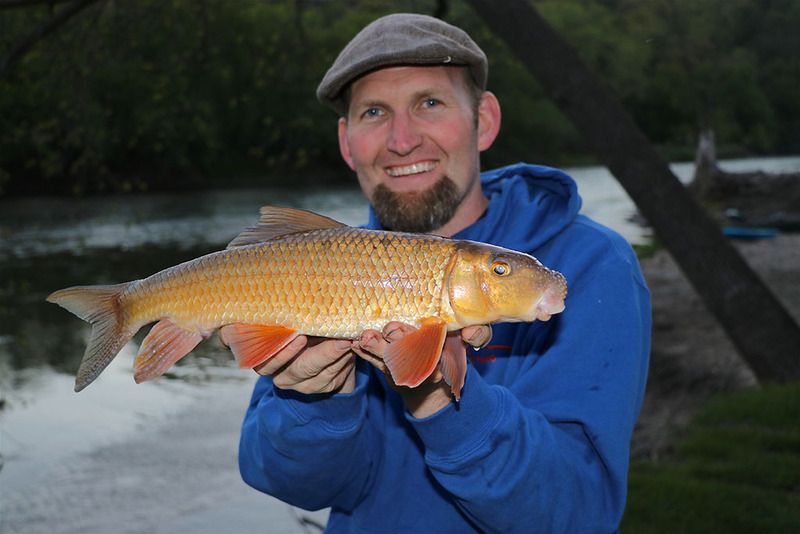 Kyle caught a beautiful golden redhorse and exclaimed that it would be his last fish for Roundup. 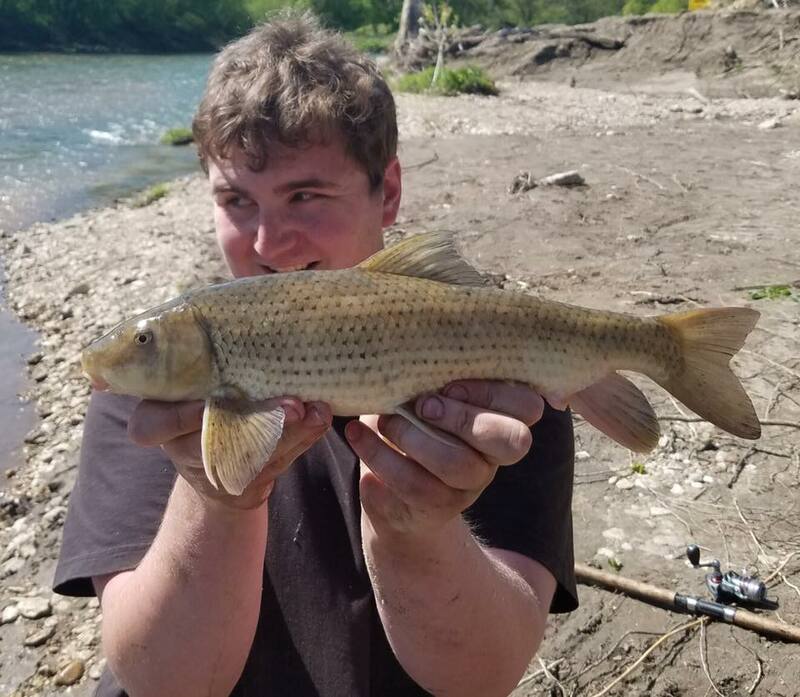 He took a photo, saying he wanted to remember this moment and this fish. I think the photo turned out great. What a year! Thanks to everyone for coming down or up or over to the event, and I can't wait for Roundup 2018! This was a blast to experience. Couldn't have asked for a better first roundup. I'm cautiously optimistic this year will offer fine fishing to those who make the drive as well. Hope to see you all soon! 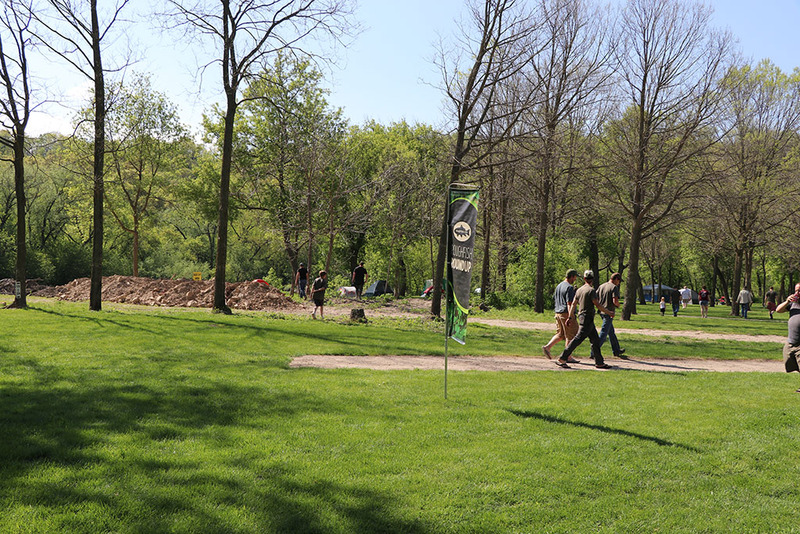 We appreciate the effort you put into immortalizing this experience every year - thank you! I hope fishaholicsanonymous sees the bit about the 'wandering coyote'. Cody fools another one! It really is going to be hard to top this roundup. A great roundup. It was cool to fish next to old and new friends. After years of wind, rain, and even snow, it was sure nice to have a solid sunny stretch to enjoy.